Back at a trade show some time ago, I once had a reader ask me what the most important price tier was for our video card reviews. Was it the high-end cards with their groundbreaking performance? Or was it the mainstream cards, which bring existing performance down to cheaper prices? It was a question I admittedly had to stop and think about for a moment. But in the end, as fun as the high-end cards are – and as fun as window shopping is – my answer to the question was that mainstream cards were more important. It is mainstream cards that more gamers can afford, and judging from trends in monitor sales, mainstream cards that most gamers actually need to drive their monitors. For the mainstream market then, a traditional NVIDIA top-to-bottom launch is both exciting and trying. Exciting because you get a sneak peek at what’s coming down the pipe in a couple of months, and trying because who doesn’t want a new video card right this second? Ultimately for NVIDIA’s largest market by volume, it means there’s a bit of a wait. But after that wait, here we are: GP106, the heart of the GeForce GTX 1060. Announced in early July, NVIDIA’s mainstream/enthusiast GPU is part of a quick succession of Pascal releases for the company, who has now released (in various fashions) 4 different Pascal GPUs. Of the Pascal family so far, GP106 is the smallest, and the cheapest. But for NVIDIA’s customers it may very well be the most important, as GTX 1060 significantly raises the performance bar for 1080p gaming. We’ll start things off as always with the specifications. 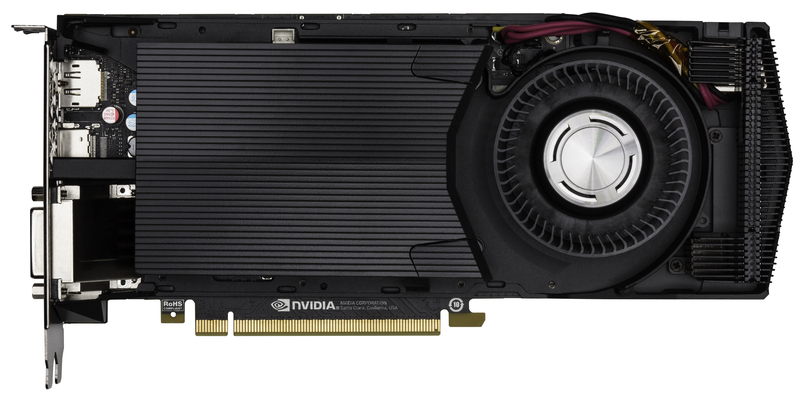 GeForce GTX 1060 ships with a fully enabled GP106 GPU, so right off the bat we’re seeing the full capabilities of NVIDIA’s mainstream GPU. A full GP106 (and consequently GTX 1060) ships with 1280 CUDA cores, which is half the number found on GTX 1080/GP104. Similarly, this means we’re looking at half the texture units, and half of the polymorph geometry engines. However on the backend of the rendering pipeline, things are a bit more interesting NVIDIA deviates a bit from tradition, and a bit from making GP106 a true halving of GP104. Whereas you’d expect half of a GP104 to ship with 4 ROP/L2/MC partitions – for a total of 32 ROPs and a 128-bit memory bus – instead we get a 6 partition setup, only 2 partitions shy of GP104. The significance of this is threefold. First, it means that GP106 isn’t strictly half of a GP104. Second, it means that it has a higher ratio of ROP throughput, L2 cache capacity, and memory bandwidth per CUDA core than parts such as GTX 1080. Third, it’s only the second time in recent history where NVIDIA has used a larger backend configuration on a mainstream part – GK106 being the first – which after NVIDIA’s performance gains and overall success with Maxwell, comes as a bit of a surprise. In any case, what we’re left with is a slightly unbalanced design for GTX 1060/GP106. The GPU’s 10 SMs are divided up into two GPCs, half the configuration of GP104. This means that GP106 can rasterize 32 pixels per clock on the frontend, but the backend ROPs can accept 48 pixels per clock. 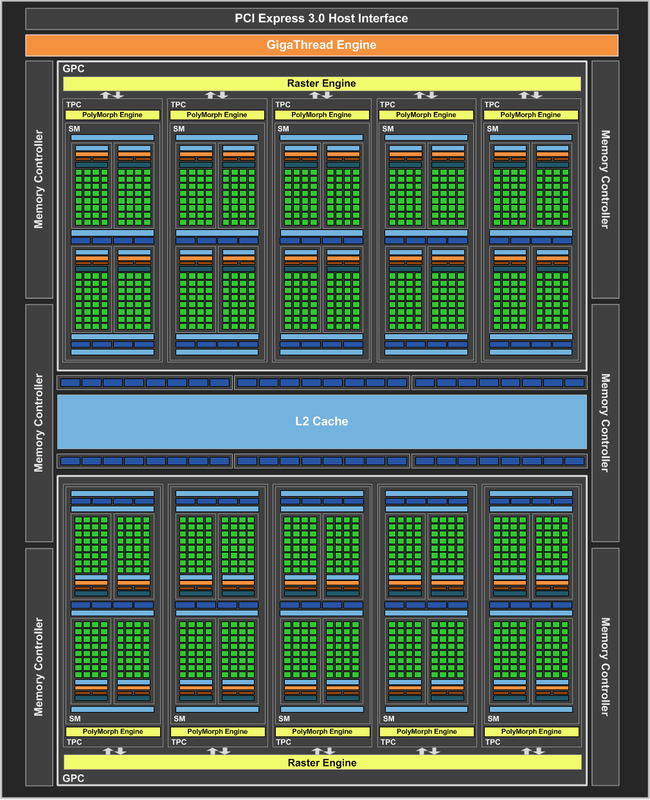 This kind of imbalance is not a bad thing – the ROPs are responsible for other tasks such as MSAA that eat up more time – but it’s interesting thing to see happen, as it gives us a bit of an idea of what kind of bottlenecks NVIDIA needed to balance out behind the scenes in the development process. As it stands, I suspect that the larger backend is a compromise solution for coming up with more memory bandwidth versus GTX 960/GM206. Relative to their Maxwell predecessors, all of the other Pascal parts so far have received significant bandwidth increases in order to feed their faster GPUs. For GTX 1080 this was GDDR5X, and for GTX 1070 this was faster 8 Gbps GDDR5 combined with a unified 256-bit memory bus. 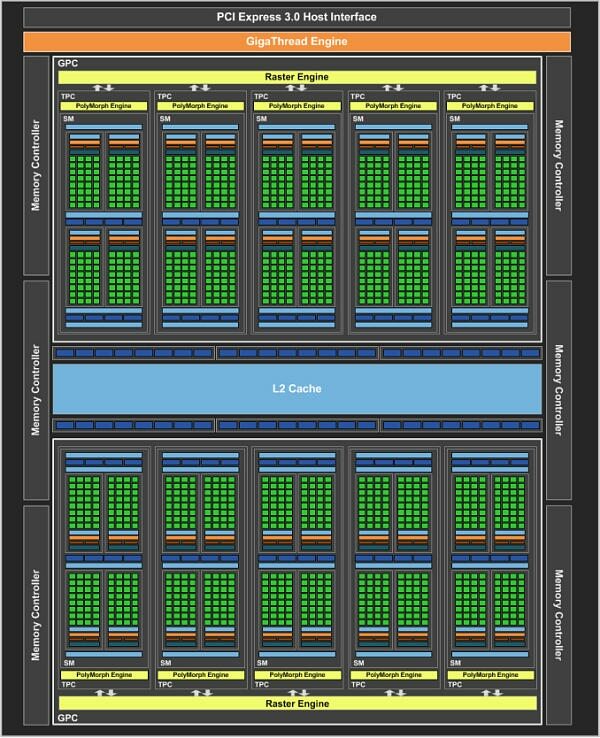 For GP106 to follow this path, NVIDIA would need to either implement GDDR5X (a more costly and volume-limited technology at this time), or go with a wider memory bus (via a wider overall backend), and the company has seemingly opted for the latter. Meanwhile even with 6 ROP partitions, GP106 ends up being a relatively small chip. At 200mm2 on the dot, it’s 12% smaller than the 227mm2 GM206 that precedes it, and even smaller than the 214mm2 GK106 before that. This makes GP106 NVIDIA’s smallest mainstream (-06) GPU to date, something that no doubt is an important factor in keeping the GPU economical on TSMC’s cutting edge (read: more expensive) 16nm FinFET process. Moving on to clockspeeds, the GTX 1060 ships with a 1.7GHz boost clock, which is smack-dab in the middle of the boost clocks for the GTX 1080 and GTX 1070. 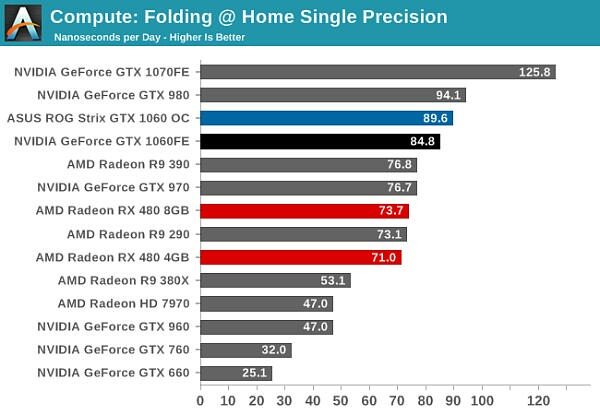 In other words, the card is clocked just as high as its higher-end siblings, and the only difference will be the overall number of processing units within the GPU. 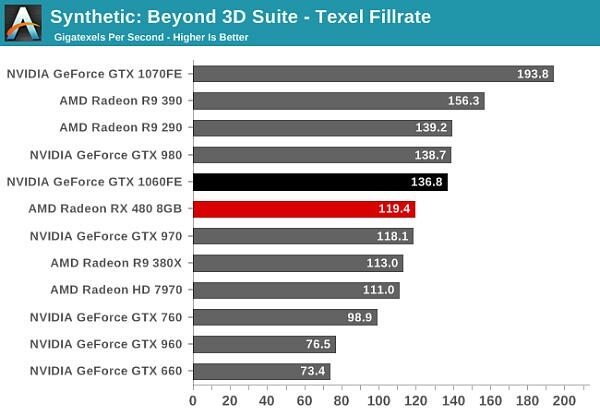 On a pure SM basis this puts GTX 1060 at 4.35 TFLOPs, giving the card 67% of the compute and geometry performance of the GTX 1070. Or to compare it to the outgoing GTX 960, we’re looking at an 80% increase in those same metrics. Geeking out about GP106 aside, let’s talk about the rest of what makes up GeForce GTX 1060. Owing to its non-power-of-two memory bus size, GTX 1060 will be shipping with 6GB of VRAM, which is 2GB less than the GP104 cards and 2-4GB more than the older GTX 960. The card will use the same 8Gbps memory as on GTX 1070, giving the card 192GB/sec of total memory bandwidth, a hefty 71% increase over GTX 960. Combined with the increased memory compression efficiency of Pascal, it goes without saying that GTX 1060 should hopefully not find itself wanting for memory bandwidth. As for power and thermals, NVIDIA is slotting GTX 1060 in the same TDP envelope as the outgoing GTX 960, which is 120W. This makes the GTX 1060 NVIDIA’s flagship sub-150W card, suitable for installation in systems that only offer a single 6-pin power connector or can’t ventilate GTX 1070+ levels of heat. Overall NVIDIA’s TDPs have fluctuated a bit over the years, especially in the hyper-competitive mainstream market. After reaching a high of 170W with GTX 760, NVIDIA invested most of their Maxwell savings in lowering the TDP for GTX 960, and this seems to have worked out well for them. Still, I think it will be interesting to see if what follows GTX 1060 will stay below 150W, as we’re at the start of what’s likely a very long cycle on TSMC’s 16nm process. What does 120W get you then? 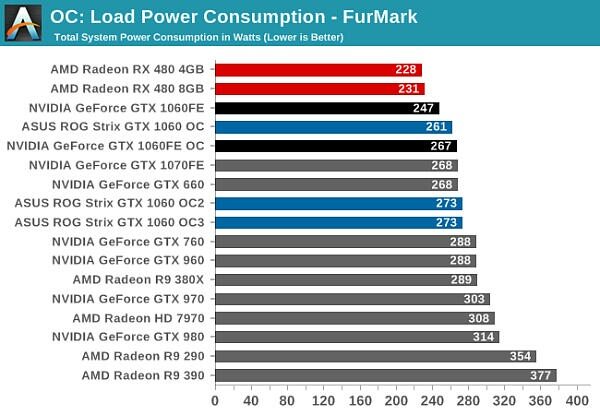 In short, it gets you just shy of GTX 980 performance combined with Pascal’s feature set for 45W (27%) less power consumption. 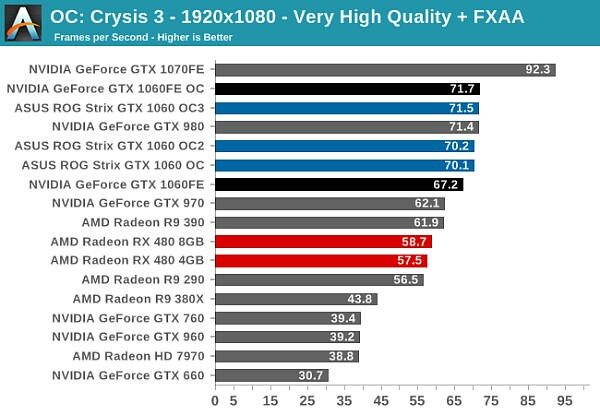 Or to frame this in reference of the other Pascal cards, we’re looking at about 73% of GTX 1070’s performance. Consequently this card rides a sometimes fine line between being a 1080p card and a 1440p card, but in practice it’s going to be best suited as a no-compromises 1080p card, especially as newer games hit the market. As for where it fits into the market, as with the GTX 1080 and GTX 1070, the situation is a bit more complicated due to the presence of reference cards and how they’re priced and sold. NVIDIA has extended the Founders Edition line to the GTX 1060, offering a reference card here as well. 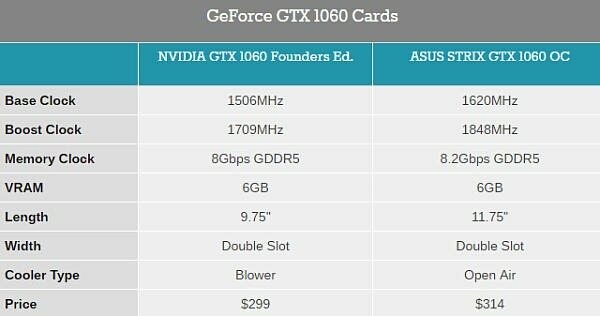 However the Founders Edition card is once again positioned as a premium card, so while its otherwise stock performance is a good proxy for the GTX 1060’s baseline performance, its price and positioning is not. 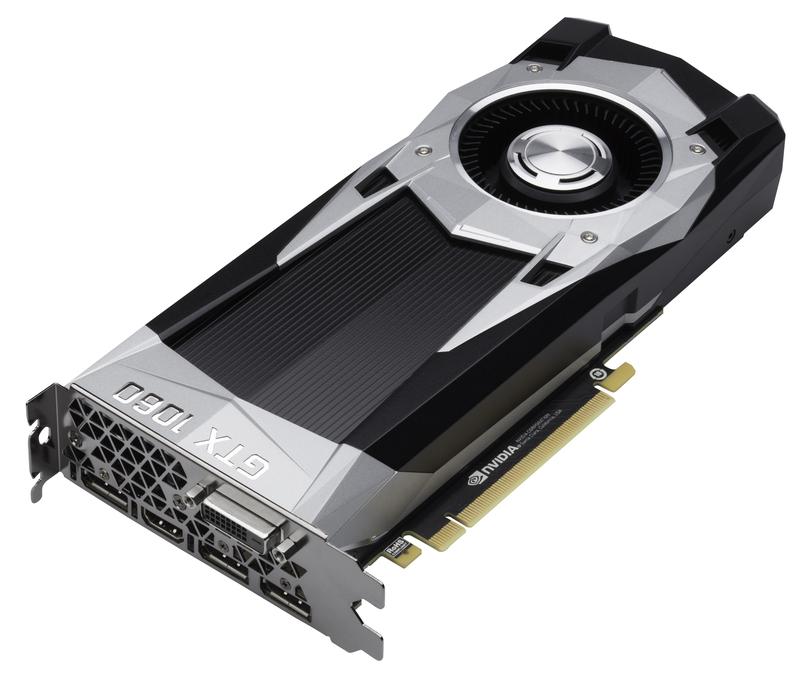 Equally important, unlike the higher-end cards, the GTX 1060 Founders Edition isn’t even a retail card in the traditional sense, but rather is only sold by NVIDIA through their web store. Pricing then is equally variable. The base MSRP for GTX 1060 starts at $249, with the NVIDIA Founders Edition card retailing for $299. Various factory overclocked then run the gamut from $259 to $314 for the aforementioned ASUS card. The end result is that there are a lot of options on the market, both with the benefit of variety and the drawback of potentially having to do some hunting to get a specific card when it’s in stock.With the GTX 1060 then, the supply of cards is almost entirely partner focused. While the reference card exists, the only card sold through traditional retailers/etailers will be their semi and fully custom designs. For partners this is a good thing, as it means they can more readily differentiate themselves from one another and need not directly compete with the reference design. At the same time for buyers this means we’re looking at a wider variety of designs, ranging from basic MSRP designs to high-end designs like the custom card we’re also having a look at today, the ASUS ROG Strix GTX 1060 OC. 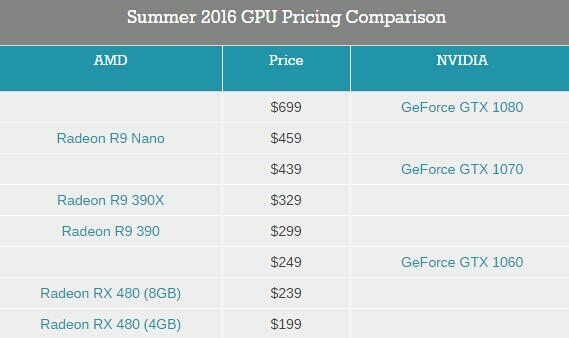 At least at MSRP then, the GTX 1060 is consistently priced with NVIDIA’s other Pascal cards, which is to say higher than the 900 series. Overall, GTX 1000 series pricing is closer to that of the 700 series, with the GTX 1060 launching at the same $249 price point the GTX 760 launched at back in 2013. As a result NVIDIA is going to miss the $199 mainstream sweet spot that the GTX 960 launched at, at least for the time being. 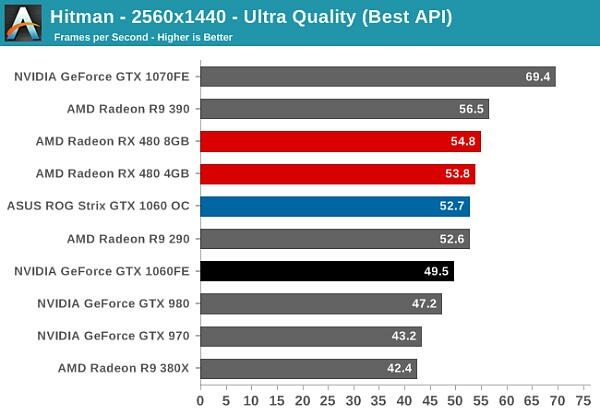 As for the competition, at MSRP GTX 1060 is clearly a shot across the bow at AMD’s Radeon RX 480 8GB, not quite overlapping it in price but otherwise going after the same target market with very aggressive performance and power targets. The difference is going to be that while AMD offers a $199 option with the 4GB RX 480 (albeit in limited numbers), NVIDIA will be aiming higher entirely, so there’s not a perfect overlap between the two. That said, NVIDIA and its partners will still be aiming to make the GTX 1060 the better value in the long run. The bigger issue for NV and partners right now is the supply issue. NVIDIA has struggled to keep supply in check with demand for the entire GTX 1000 series. GTX 1060 has not proven any different in that regard. Inventory trackers show that cards come into stock regularly, but they also go just as quickly. 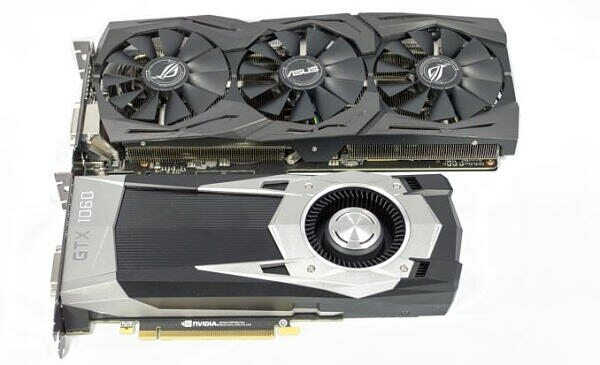 The one thing that has gone better for buyers – or at least those who can get their hands on a card – is that prices haven’t gone over MSRP like on the other GeForce cards. GTX 1060 cards still hit the market at $249. Traditional economic theory means that having prices hold to MSRP is probably worsening the supply shortage – so there is a tradeoff to be had – but it also means that NVIDIA and its partners (and their retailers) aren’t gouging consumers. We’ll start off our look at GeForce GTX 1060 cards with NVIDIA’s Founders Edition card. That there’s a retail reference card for GTX 1060 is actually a bit of a surprise here. NVIDIA has not consistently offered retail reference cards for the GTX x60 family over the years. These cards sell for lower margins, and with their lower TDP and overall simpler design, there’s simply not the same need or market for a retail reference design as with the higher end cards. As a result, while the Founders Edition cards are a bit harder to swallow with the higher-end GeForces, here it makes a bit more sense. It’s essentially an NVIDIA exclusive design separate from the partner cards, albeit at a higher price. But perhaps more importantly, it’s one of the only two GTX 1060 blower designs being sold, which makes it a unique offering amidst the many open air designs on the market. Albeit one at $299, $50 over the base GTX 1060’s MSRP. In terms of styling, the GTX 1060 Founders Edition is designed to look like the higher end Founders Edition cards. This keeps a consistent look to the Founders Edition lineup, however a consistent look is also as far as the similarities go. Absent is the metal shroud of the high-end cards, replaced with a simpler plastic shroud, which is more along the lines of what you’d expect for a cheaper, lower TDP card. That said, even just handling the card makes it clear that NVIDIA took care to maintain a high build quality; the shroud is solid with no flimsiness or weak seams. Of all of the plastic NVIDIA blowers I’ve looked at over the years, this is likely the best, easily ahead of the reference GTX 680 and other efforts. A lot of this has to do with the fact that while the shroud is plastic, NVIDIA has otherwise built the card like one of their higher-end cards, with plenty of fasteners and some metal – aluminum, I suspect – used at key points. Going under the hood also continues this analogy, as we find a metal baseplate running the length of the card, with an aluminum heatsink for the GPU covering much of the board. The amusing bit is that the blower itself is larger than the card’s PCB due to the amount of space a blower needs for the fan and heatsink assemblies. 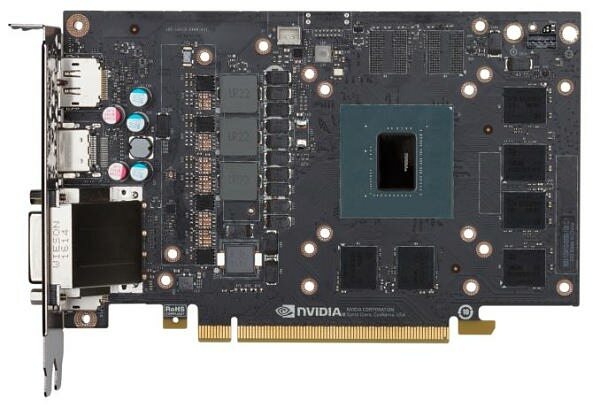 The GTX 1060 PCB measures just 6.75” long – not too much longer than the PCIe x16 slot connector – while the shroud adds another 3” to that, bringing the total length to 9.8”. NVIDIA keeps the PCB and shroud flush with each other through some careful engineering with the overhanging part of the shroud, but it’s none the less an interesting sight when the cooler is larger than the board it needs to cool. Looking at the PCB itself, what we find is a pretty typical design for a Gx106 card. 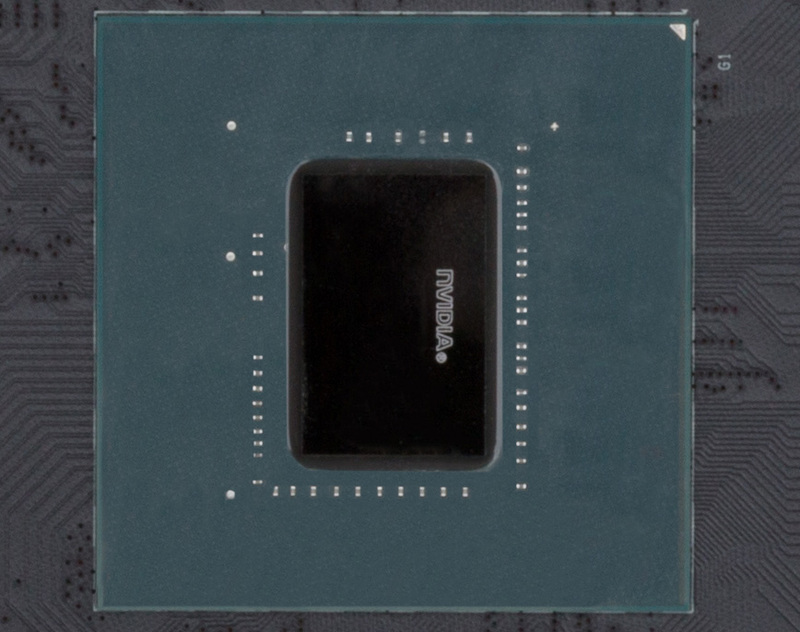 NVIDIA has shifted the 3+1 phase power delivery circuitry to the front of the board, allowing the GPU and its associated GDDR5 RAM to be placed near the rear. Curiously, there are two empty GDDR5 pads here, despite the fact that GP106 and its 192-bit memory bus can only connect to 6 pads. From what I hear, this PCB is designed to accommodate GP104 as well (a potential third tier GP104 card, perhaps? ), leading to the additional memory pads. In any case this is a simple but functional design, like previous NVIDIA reference PCBs before it. Moving on, towards the top of the card we find the requisite power connector. NVIDIA’s reference PCB doesn’t actually place the 6-pin power connector on the PCB itself; rather it’s built into the shroud with an internal wire to carry it the rest of the way. This is an unusual design choice, as we haven’t seen this done before for cards with short PCBs. As far as I know there’s no technical reason NVIDIA needed to do this, but it does allow for the 6-pin connector to be placed at the far end of the card, which I imagine will please system integrators and others who are accustomed to short, minimally visible cable runs. Meanwhile, looking at NVIDIA’s display I/O configuration, it’s physically unchanged from the other Pascal reference boards. This means we’re looking at 3x DisplayPort 1.4, 1x HDMI 2.0b, and 1x DL-DVI-D. The one connector you won’t find on the GTX 1060 is the SLI connector. NVIDIA has been rethinking their SLI strategy for the Pascal generation, which as we’ve seen for GTX 1080/1070 has resulted in NVIDIA deprecating 3 and 4-way SLI support. GTX 1060 has not escaped this retooling either, with NVIDIA removing (or rather, not building in) most of their traditional SLI support. Given the struggling state of multi-GPU scaling that I discussed in the GTX 1080 review, I had initially suspected that removing SLI support from the GTX 1060 was a further consequence of those scaling difficulties. However in discussing the matter with NVIDIA, they informed me that the rationale for this decision is based on economics more than technical matters. As it turns out, SLI is not used very often with GTX x60 class cards. Due to the aforementioned scaling issues there’s little reason to buy a pair of x60 cards right off the bat as opposed to a single x70/x80 card, and meanwhile by the time most customers were ready to upgrade again, it was 12+ months down the line, and buying a next generation card made would make more sense than doubling up on a now older card. The end result is that NVIDIA has opted to remove SLI support for the GTX 1060 series, making the feature exclusive to the GTX 1070 and above. For customers looking for more performance this essentially locks them into following what has long been our own recommended path: buy the fastest card first (scale up), and then go SLI after that if you need more performance (scale out). As I noted before this is an economic decision – this was a feature that few people were using in this class of card – but at the same time it is a removed feature, so it’s also not really a positive thing. That said, in keeping with our traditional advice on multi-GPU I don’t consider SLI the best way to go with a mainstream card to begin with, so it’s not a feature I’m going to miss. In any case, while NVIDIA has removed formal support for SLI from this class of product, it’s important to note that they haven’t removed multi-GPU support entirely. DirectX 12’s built in mGPU support supersedes SLI in some cases, so game developers can still offer multi-GPU support if they’d like. NVIDIA pulling SLI support only impacts scenarios where NVIDIA’s drivers were responsible for mGPU: games using DX11 or lower, and games using DX12’s implicit Linked Display Adapter (LDA) mode. Games that use explicit multi-adapter (e.g. Ashes of the Singularity) or explicit LDA can still setup mGPU. So multi-GPU on GTX 1060 isn’t truly dead, though I also don’t think we’re going to see too many game vendors bother to formally qualify a GTX 1060 mGPU setup regardless of what the API allows, since it’s going to be so uncommon. For our review of the GTX 1060, we’re using NVIDIA’s 368.81 driver. Our 2016 benchmark suite is otherwise identical to how it was described in our GTX 1080 review. Meanwhile I’ve gone ahead and included a spectrum of cards, not only contemporary competitors like the Radeon RX 480 8GB, but also historical cards such as the GTX 760 and GTX 660, to give us an idea of how performance has improved in this segment over the generations. Starting things off in our benchmark suite is the built-in benchmark for Rise of the Tomb Raider, the latest iteration in the long-running action-adventure gaming series. 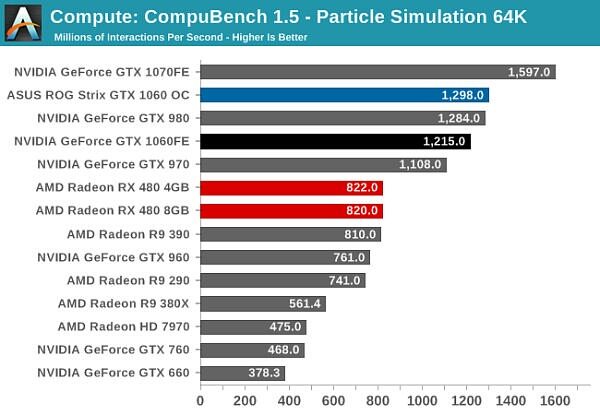 One of the unique aspects of this benchmark is that it’s actually the average of 4 sub-benchmarks that fly through different environments, which keeps the benchmark from being too weighted towards a GPU’s performance characteristics under any one scene. 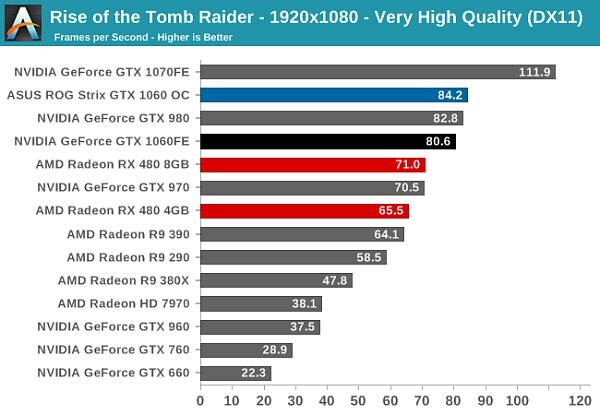 NVIDIA promised GTX 980-like performance for the GTX 1060, and this is more or less where they’ve landed under Tomb Raider. The otherwise stock clocked GTX 1060FE underperforms GTX 980 by only a frame or two, delivering about 97% of the performance, while the factory overclocked ASUS card makes up the difference and takes the lead. Or to compare things to the next tier up, GTX 1060 is delivering about 72% of GTX 1070’s performance for about 65% of the price. 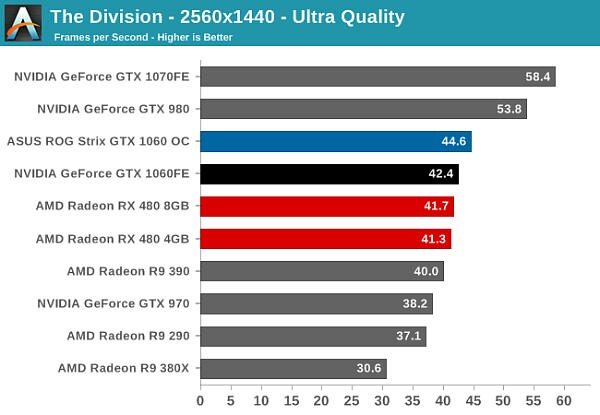 Meanwhile the performance gains over the past generation GTX x60 cards are remarkable. Whereas GTX 960 struggled to break out of the 30s on framerate, GTX 1060 just cracks 80fps. 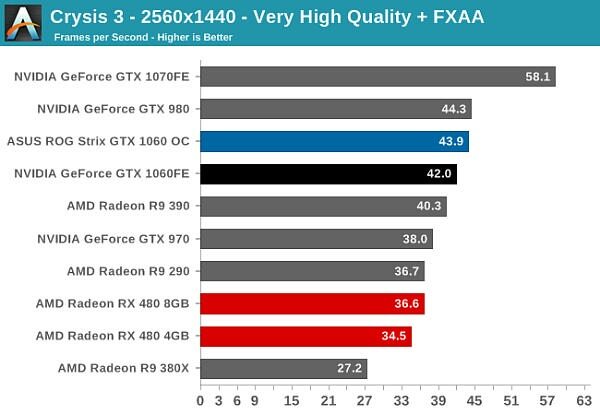 This is 215% of GTX 960’s performance, more than doubling its predecessor. Some of this I don’t doubt comes down to memory – our GTX 960 is the more common 2GB variety – but it also goes to show once again how 2GB cards are now VRAM limited under modern games. 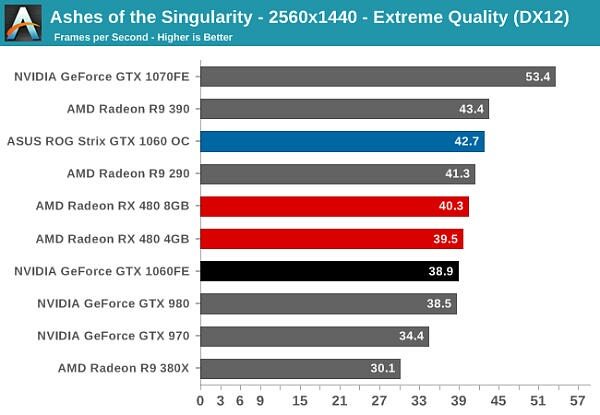 And the performance gains are even greater if we go back to 2013’s GTX 760 or 2012’s GTX 660. 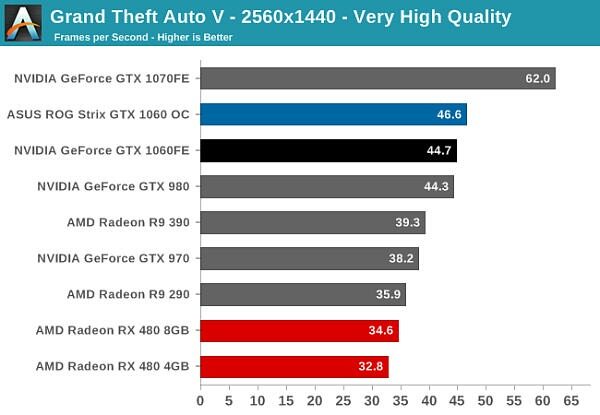 GTX 960’s one disappointment was that it didn’t make as much progress over GTX 760 as everyone would like, but GTX 1060 more than makes up for this. As for the AMD competition, things shape up about as you’d expect. In our look at RX 480 we found that it delivered GTX 970-like performance, while GTX 1060 is slated to deliver GTX 980-like performance. 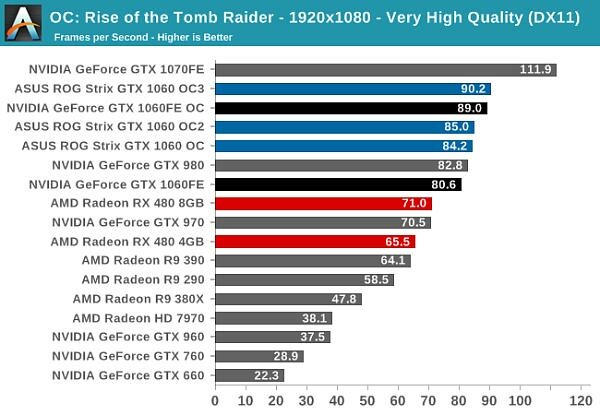 As a result we see the GTX 1060 lead by around 15% at both resolutions for Tomb Raider. For the racing game in our benchmark suite we have Codemasters’ DiRT Rally. Codemasters continues to set the bar for graphical fidelity in racing games, delivering realistic looking environments with layered with additional graphical effects. Based on their in-house EGO engine, DiRT Rally includes a number of DirectCompute based compute shader effects, and while it’s not the most punishing game in our suite, it still takes a very good card to sustain the 60fps frame rate that driving games are best played at. DiRT Rally is another strong showing for the GTX 1060. This time even the stock clocked card edges out GTX 980, and ASUS’s factory overclocked card adds on another 10% at 1440p. This also becomes one of the few games where GTX 1060 is plenty fast for 1440p with everything turned up, as it has no problem holding over 60fps in this game. 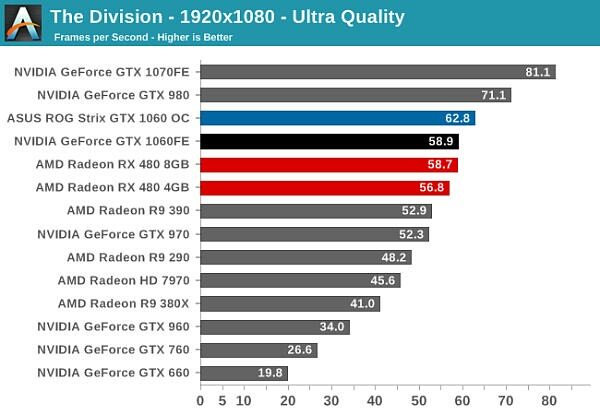 As for the generational comparisons, GTX 1060 remains ahead of the curve for Pascal cards. 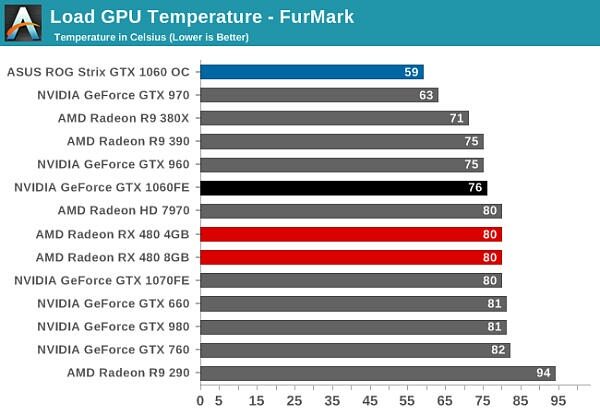 Relative to GTX 960, it offers 77% better performance. Though the gap between it and GTX 1070 is also a bit larger, with GTX 1060 offering 74% of its faster sibling’s performance. Finally, against the RX 480, GTX 1060 bests its AMD competitor by 14%. Sorely missing from our benchmark suite for quite some time have been RTSes, which don’t enjoy quite the popularity they once did. As a result Ashes holds a special place in our hearts, and that’s before we talk about the technical aspects. Based on developer Oxide Games’ Nitrous Engine, Ashes has been designed from the ground up for low-level APIs like DirectX 12. 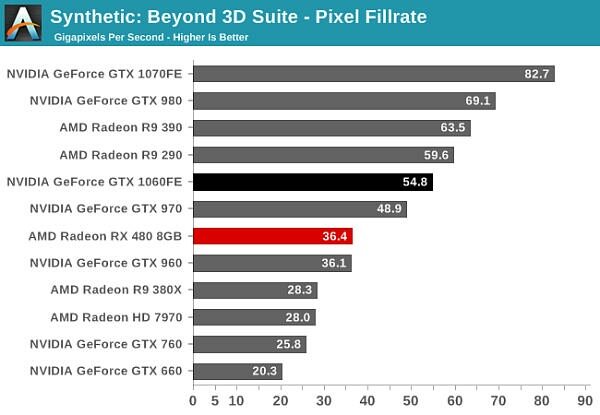 As a result of all of the games in our benchmark suite, this is the game making the best use of DirectX 12’s various features, from asynchronous compute to multi-threaded work submission and high batch counts. What we see can’t be extrapolated to all DirectX 12 games, but it gives us a very interesting look at what we might expect in the future. Ashes is a game that in our GTX 1080 review we found AMD does rather well in, with their last generation cards still challenging GTX 1070 at times. So I was surprised to see GTX 1060 and RX 480 so close here. At 1440p GTX 1060 trails by just a couple of percent, and at 1080p it’s a dead heat. Given that of all of the games in our current benchmark suite this is the game that AMD seems to do the best on, it’s notable that GTX 1060 can keep up with AMD’s card even when it’s on the backfoot. Given that NVIDIA is charging a slight price premium for the GTX 1060, it’s helpful for NVIDIA that the card never falters against its slightly cheaper competitor. That said there is also the spoiler effect of the cheaper 4GB RX 480, but that’s a slightly more complex matter for the conclusion of this article. Meanwhile on a generational basis, GTX 1060 continues to deliver GTX 980-like performance. 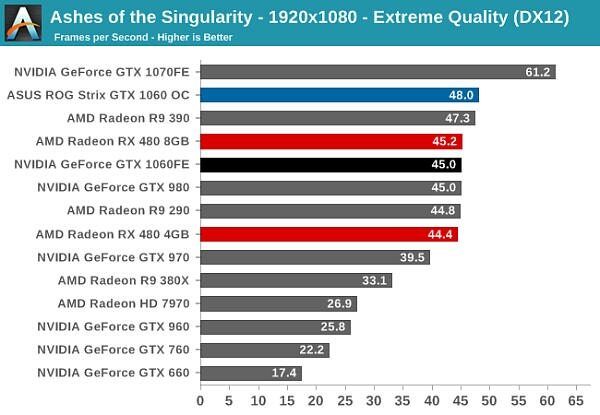 Or against the GTX 960, we’re looking at a considerable 74% performance improvement. GTX 1060 is even fast enough to do better than 30fps at 1440p with the Extreme settings, which for an RTS is perfectly playable. However GTX 1070 still has a significant lead over the GTX 1060 here. One of the older games in our benchmark suite, DICE’s Battlefield 4 remains a staple of MP gaming. Even at its age, Battlefield 4 remained a challenging game in its own right, as very few mass market MP shooters push the envelope on graphics quality right now. As these benchmarks are from single player mode, based on our experiences our rule of thumb here is that multiplayer framerates will dip to half our single player framerates, which means a card needs to be able to average at least 60fps if it’s to be able to hold up in multiplayer. Switching gears to a game that has traditionally favored NVIDIA, the GTX 1060 comes out swinging here. At 60.6fps the card is just fast enough to crack 60fps at 1440p, meaning that even the minimum framerates should stay above 30fps. The ASUS card adds a further 5% here, which still a decent gain, though lower than we’ve seen elsewhere. Compared to the last-gen GTX 960, this is an above-average game for the GTX 1060, as it improves on its predecessor by 87%, and more still with the even older NVIDIA cards. Meanwhile the performance gap between it and the GTX 1070 is about average, with GTX 1060 delivering 72% of GTX 1070’s performance. As for RX 480, the GTX 1060 takes its largest performance lead. Overall the card is head of AMD’s 8GB competition by 30-35% depending on the resolution. Whereas Battlefield 4 was rather forgiving to the GTX 1060 at even 1440p, Crysis 3 is the opposite. While over 30fps, 42fps leaves a long way to go before hitting the all-important 60fps fluidity mark for this FPS. At 1080p on the other hand it has no trouble sustaining over 60fps. This does, however, end up being one of the only games where GTX 1060 isn’t neck-and-neck with GTX 980. Even the factory overclocked ASUS card is a bit off of GTX 980, though it’s still 4% ahead of the stock GTX 1060. Compared to the GTX 1070 then, the GTX 1060 delivers fairly typical performance at 73% of its faster sibling. 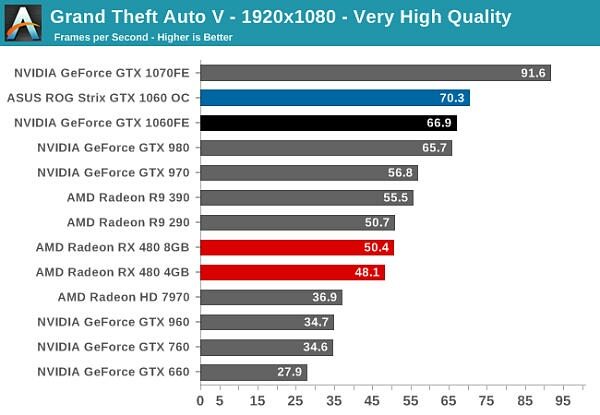 Versus GTX 960 this is a 71% performance gain, which is actually the smallest performance gain we’ll see throughout our entire benchmark suite. On which note, looking farther down the charts we have to compare GTX 1060 against GTX 660 to find a better than 2x performance increase. Finally, against the RX 480, GTX 1060 once again delivers a 14% performance gain versus its closest competition. The third game in CD Projekt RED’s expansive RPG series, The Witcher 3 is our RPG benchmark of choice. 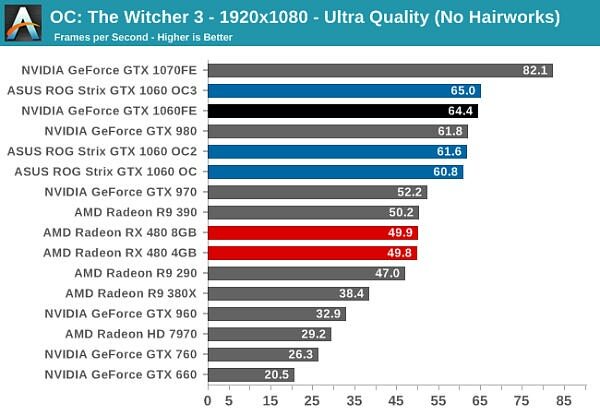 Utilizing the company’s in-house engine, REDengine 3, The Witcher makes use of an array of DirectX 11 features, all of which combine to make the game both stunning and surprisingly GPU-intensive. Our benchmark is based on an action-heavy in-engine cutscene early in the game, and Hairworks is disabled. In terms of absolute performance, I’m a bit surprised that the GTX 1060 can’t crack 60fps at 1080p. 57.6 isn’t too far off the mark, but for what’s otherwise meant to be NVIDIA’s ultimate 1080p gaming card, it’s not quite ultimate enough to hit 60fps on a year-old game. In any case this does put GTX 1060 a bit farther behind the GTX 980 than usual, delivering around 94% of its high-end predecessor’s performance. Or to compare the card to GTX 960, it nets a 75% performance gain. Otherwise this also happens to be a game where the GTX 1060/1070 gap is a smidge larger than usual, with GTX 1060 delivering 70% of GTX 1070’s performance. Finally, as for the RX 480 comparison, GTX 1060 is yet again solidly in the lead. Here we see it deliver 12-15% more performance than the 8GB RX 480, depending on the resolution. The final first person shooter in our benchmark suite, The Division is a multiplayer-only game powered by Ubisoft’s Snowdrop engine. The game’s design focuses on detailed urban environments and utilizes dynamic global illumination for parts of its lighting. For our testing we use the game’s built-in benchmark, which cycles through a number of scenes/areas of the game. 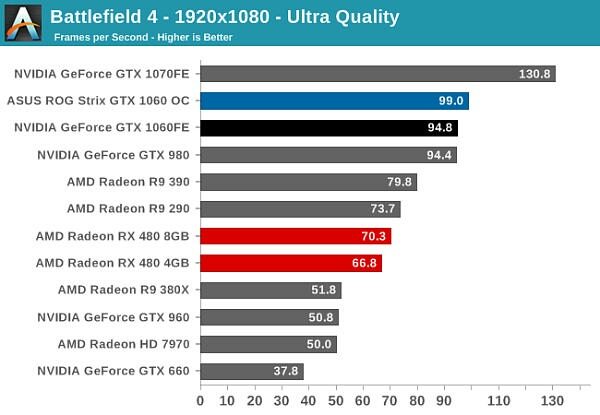 For whatever reason, the GTX 980 has always hit above its weight in The Division, and as a result this is the one game where the GTX 1060 can’t stay at parity with the one-time NVIDIA flagship. In fact this is another case where the GTX 1060 can’t quite muster 60fps at 1080p, falling just short at 58.9fps. However the ASUS card does get to do what the reference card cannot, with its factory overclock adding another 7% to the total. 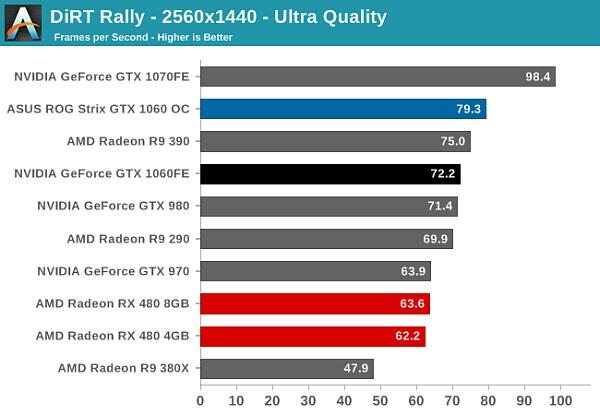 Meanwhile compared to the AMD competition, this is the second instance of GTX 1060 and RX 480 coming in virtually tied. At both 1440p and 1080p the cards are off by less than 1fps, so while GTX 1060 is typically comfortably ahead of AMD’s best, that’s not always the case. Finally, compared to the GTX 960 we’re looking at a 73% performance gain. Past that, the generational gains get especially large; by the time we’re looking at GTX 660, GTX 1060 delivers more than 3x the performance. The latest edition of Rockstar’s venerable series of open world action games, Grand Theft Auto V was originally released to the last-gen consoles back in 2013. However thanks to a rather significant facelift for the current-gen consoles and PCs, along with the ability to greatly turn up rendering distances and add other features like MSAA and more realistic shadows, the end result is a game that is still among the most stressful of our benchmarks when all of its features are turned up. Furthermore, in a move rather uncharacteristic of most open world action games, Grand Theft Auto also includes a very comprehensive benchmark mode, giving us a great chance to look into the performance of an open world action game. On a quick note about settings, as Grand Theft Auto V doesn't have pre-defined settings tiers, I want to quickly note what settings we're using. For "Very High" quality we have all of the primary graphics settings turned up to their highest setting, with the exception of grass, which is at its own very high setting. Meanwhile 4x MSAA is enabled for direct views and reflections. This setting also involves turning on some of the advanced redering features - the game's long shadows, high resolution shadows, and high definition flight streaming - but it not increasing the view distance any further. Otherwise for "High" quality we take the same basic settings but turn off all MSAA, which significantly reduces the GPU rendering and VRAM requirements. 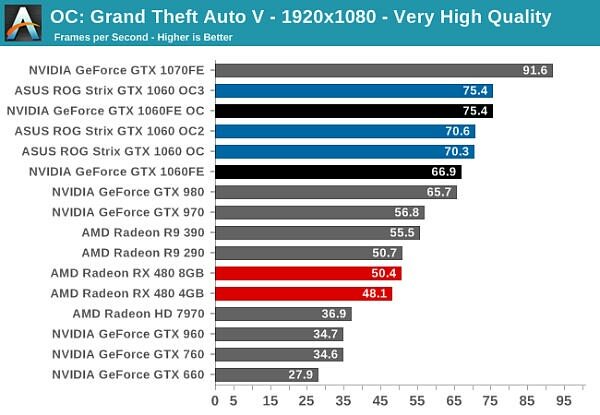 While more often than not GTX 1060 trails GTX 980 by a couple of percent, in GTAV the tables get turned. Now GTX 1060 has the lead, albeit a trivial 1-2%. The net result is that much like its last-generation predecessor, GTX 1060 can deliver framerates in the mid-40s at 1440p, but you need to go to 1080p to average better than 60fps. Meanwhile compared to GTX 960 we’re looking at another case where more VRAM and GPU performance improvements combine to make GTX 1060 punch above its weight. 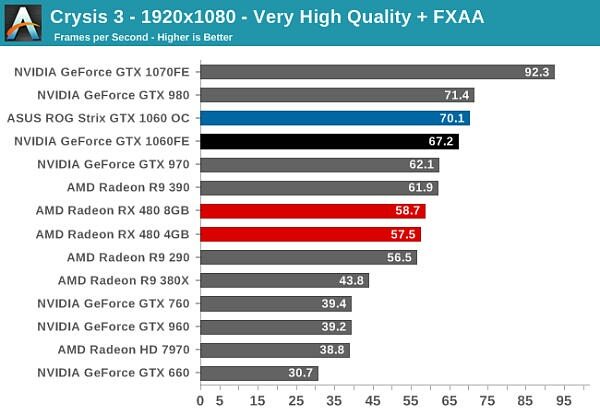 Here the new NVIDIA card outperforms the last-generation x60 card by 93%. Otherwise compared to the more powerful GTX 1070, we’re looking at about 73% of that card’s performance. Finally, this is another game where the GTX 1060 compares very favorably to the RX 480. Here NVIDIA leads by 30%. Shifting gears to 99th percentile framerates, the story is much the same as with the averages. GTX 1060 retains a comfortable lead over the competition and in the process stays above 30fps, even at 1440p. The final game in our 2016 benchmark suite is the 2016 edition of Hitman, the latest title in the stealth-action franchise. The game offers two rendering paths: DirectX 11 and DirectX 12, with the latter being the case of DirectX 12 being added after the fact. As with past Hitman games, the latest proves to have a good mix of scenery and high model counts to stress modern video cards. While the full API results are broken out in Bench, for this article I’m only listing the performance with the faster API for each card, as at this point we’ve seen a very consistent pattern in Hitman: AMD cards do better under DX12, while NVIDIA cards do better under DX11. In any case, this is the one and only case where we see the GTX 1060 lose. At both 1440p and 1080p NVIDIA’s mainstream card falls to AMD’s own mainstream competitor by roughly 10%. 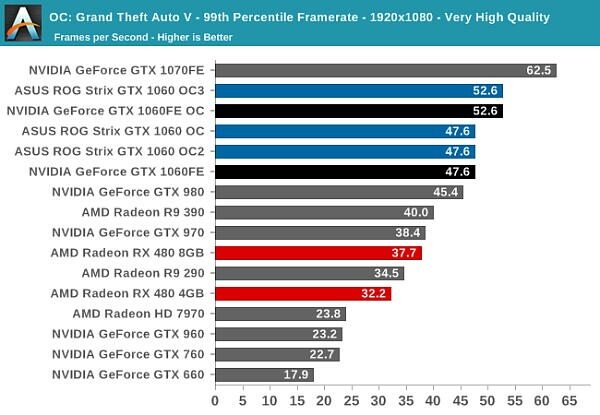 This despite the fact that GTX 1060 enjoys a larger than normal 4-5% performance advantage over GTX 980. 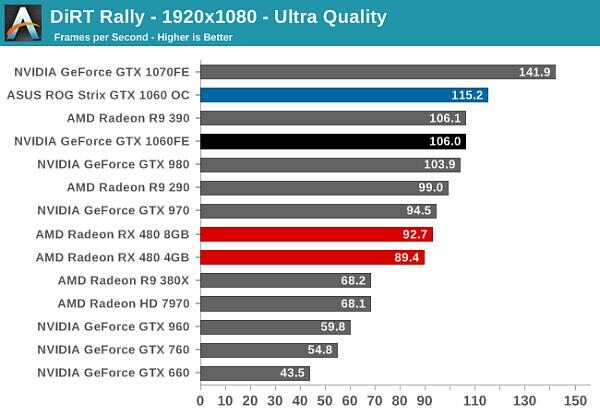 As for the generational comparisons, GTX 1060 at least comes out well ahead of its predecessors. Compared to GTX 960 it delivers over twice the performance of NVIDIA’s former mainstream card, and nearly 3.5x more performance than GTX 660. Shifting gears, let’s take a look at compute performance on GTX 1060. As we already had the chance to categorize the Pascal architecture’s compute performance in our GTX 1080 review, there shouldn’t be any surprises here. But it will be interesting to see whether the GTX 1060’s higher ratio of memory bandwidth per FLOP materially impacts overall compute performance. Starting us off for our look at compute is LuxMark3.1, the latest version of the official benchmark of LuxRender. LuxRender’s GPU-accelerated rendering mode is an OpenCL based ray tracer that forms a part of the larger LuxRender suite. Ray tracing has become a stronghold for GPUs in recent years as ray tracing maps well to GPU pipelines, allowing artists to render scenes much more quickly than with CPUs alone. While GTX 1060 could hang with GTX 980 in gaming benchmarks, we don’t start off the same way with compute benchmarks, with the last-generation flagship holding about 17% ahead. Unfortunately for NVIDIA, this is about where GTX 1060 needed to be to best RX 480; instead it ends up trailing the AMD competition. 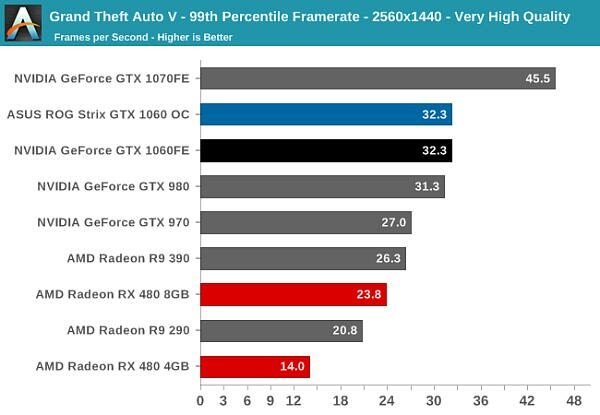 Otherwise the performance gain versus the GTX 960 stands at 65%. For our second set of compute benchmarks we have CompuBench 1.5, the successor to CLBenchmark. 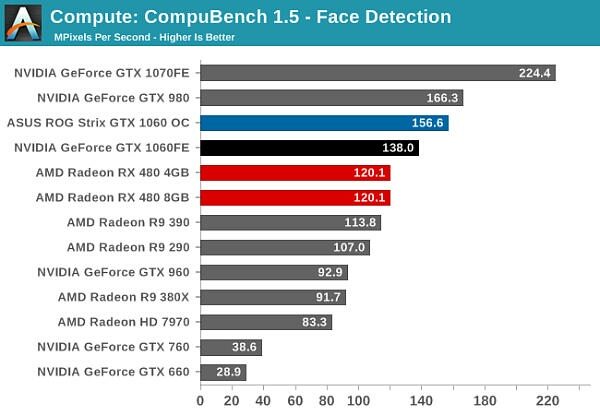 CompuBench offers a wide array of different practical compute workloads, and we’ve decided to focus on face detection, optical flow modeling, and particle simulations. Like with GTX 1080, relative performance is all over the place. GTX 1060 wins with face detection, loses at optical flow, and wins again at particle simulation. Even the gains versus GTX 960 are a bit more uneven, though at the end of the day GTX 1060 ends up being significantly faster than its predecessor with all 3 sub-benchmarks. Moving on, our 3rd compute benchmark is the next generation release of FAHBench, the official Folding @ Home benchmark. Folding @ Home is the popular Stanford-backed research and distributed computing initiative that has work distributed to millions of volunteer computers over the internet, each of which is responsible for a tiny slice of a protein folding simulation. FAHBench can test both single precision and double precision floating point performance, with single precision being the most useful metric for most consumer cards due to their low double precision performance. Each precision has two modes, explicit and implicit, the difference being whether water atoms are included in the simulation, which adds quite a bit of work and overhead. This is another OpenCL test, utilizing the OpenCL path for FAHCore 21. Finally, in [email protected], we see the usual split between single precision and double precision performance. GTX 1060 is solidly in the lead when using FP32, but NVIDIA’s poor FP64 rate means that if double precision is needed, RX 480 will pull ahead. As always we’ll also take a quick look at synthetic performance. While GTX 1060 is of course a cut down Pascal architecture part, how it has been cut down is interesting. Compared to GP104, GP106 has half the SMs and GPCs, but 3/4 the ROPs, which may prove to have an impact. Starting off with tessellation performance, we find the GTX 1060 coming in just behind the GTX 980, showing that NVIDIA’s performance estimates generally apply not only to games, but synthetic tests as well. 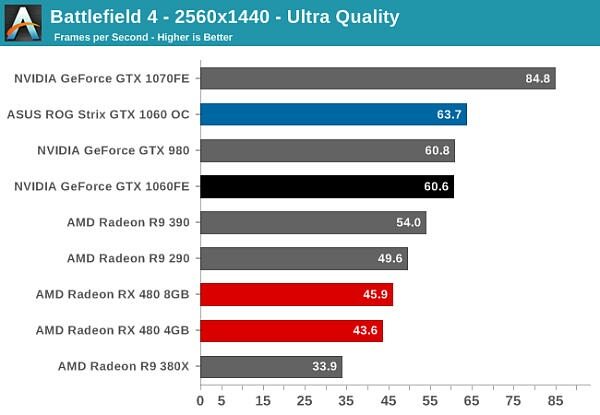 But perhaps more interesting is the fact that the card is neck-and-neck with the Radeon RX 480. NVIDIA has traditionally enjoyed a sizable geometry performance lead over AMD cards, but it looks like those days have come to a close. Up next, we have SteamVR’s Performance Test. While this test is based on the latest version of Valve’s Source engine, the test itself is purely synthetic, designed to test the suitability of systems for VR, making it our sole VR-focused test at this time. It should be noted that the results in this test are not linear, and furthermore the score is capped at 11. 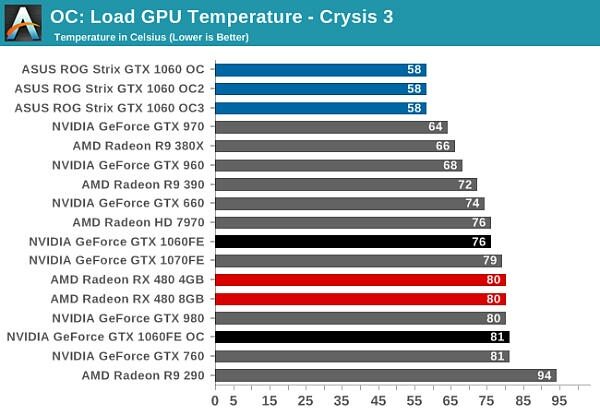 Of particular note, cards that fail to reach GTX 970/R9 290 levels fall off of a cliff rather quickly. So test results should be interpreted a little differently. As NVIDIA’s now entry-level VR card, GTX 1060 looks very good in the Steam VR test. 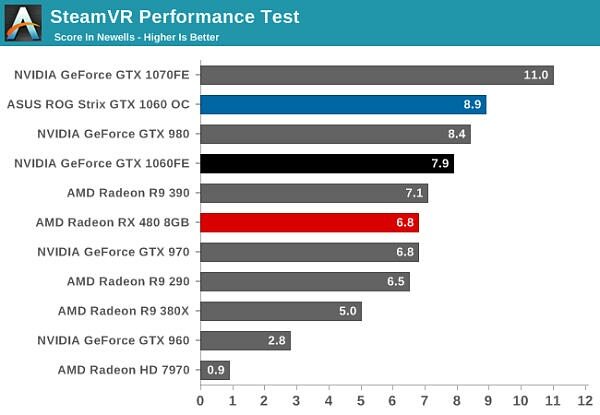 A score of 7.9 Newells means that it’s comfortably above the 6.x range generally required, and it also means the GTX 1060 is comfortably ahead of the RX 480 in this scenario. Finally, for looking at texel and pixel fillrate, we have the Beyond3D Test Suite. This test offers a slew of additional tests – many of which use behind the scenes or in our earlier architectural analysis – but for now we’ll stick to simple pixel and texel fillrates. Starting with the pixel fillrate, we can see the impact of GTX 1060’s slightly more unusual ROP and GPC arrangement when it’s compared to the GTX 980. At 54.8 GPixels/second, GTX 1060 trails GTX 980 significantly. The card not only has fewer ROPs, but it has half of the rasterizer throughput (32 pixels/clock) as GTX 980. As we’ve seen in our gaming benchmarks the real-world impact isn’t nearly as great as what happens under these synthetic tests, but it helps to explain why sometimes GTX 1060 is tied with GTX 980, and other times it’s several percent behind. If nothing else, at an architectural level this is what makes GTX 1060 a better 1080p card than a 1440p card. As for texel throughput, things are right where we expect them. GTX 1060 is virtually tied with GTX 980, and while it’s ahead of RX 480 in the process, it’s not by a massive amount. 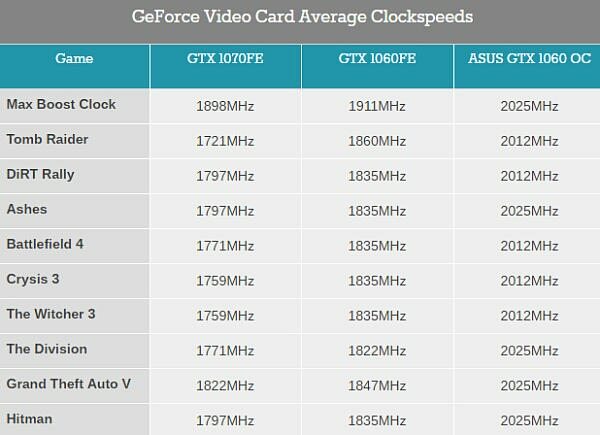 Moving on, let’s take a look at average clockspeeds. 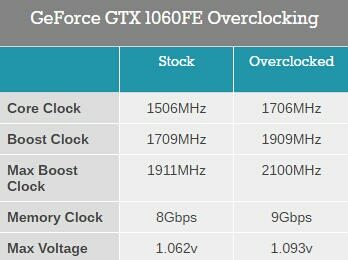 GTX 1060 has the same base GPU clockspeed as GTX 1070, but a slightly higher boost clockspeed rating. So if NVIDIA’s boost ratings are accurate, GTX 1060 should maintain a slightly higher average clockspeed.Starting with voltages, unsurprisingly we find that the GP106 GPU in GTX 1060 operates in the same voltage range as the GP104 parts, topping out at 1.062v according to GPU-Z. That said, when putting the card through its paces, it seemed like it needed to go to the maximum voltage less often than GTX 1080/1070 did. This bodes well for power efficiency, but it also means that the temperature compensation effect is a bit different for GTX 1060: voltage has room to go up for a bit before clockspeeds finally need reined in. 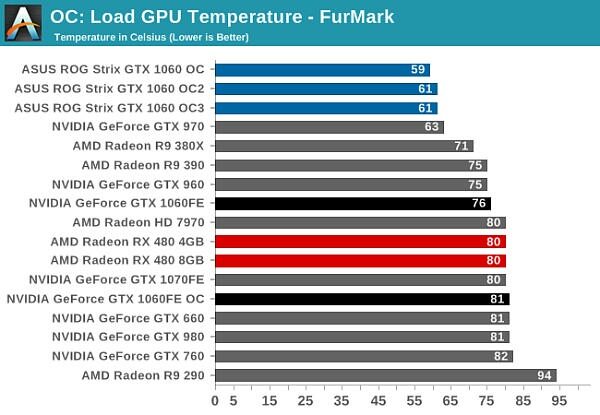 Meanwhile the factory overclocked ASUS Strix GTX 1060 OC and its overbuilt design mean that the card essentially never has to yield to anyone or anything. With a maximum boost bin of 2025MHz, the average game clocks are either at 2025MHz or just a single boost bin lower at 2012MHz. Suffice it to say, the only thing stopping the GP106 GPU in this card from running faster is that it has run out of boost bins to reach for.And this is what we see. In fact the average clockspeed is a little higher than I would have expected. GTX 1060 never averages less than 1822MHz, which is a good 100MHz over its rated boost clock. 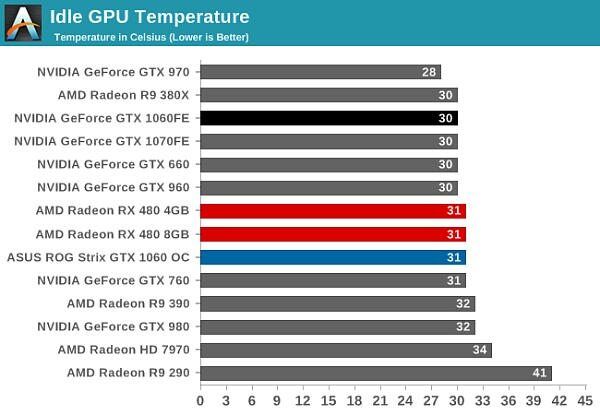 Part of this comes down to the fact that the GTX 1060FE never temperature throttles (more on this later), which means it’s held back by only a combination of TDP limits, utilization, and temperature compensation. With clockspeeds out of the way, let’s get down to business with power numbers. 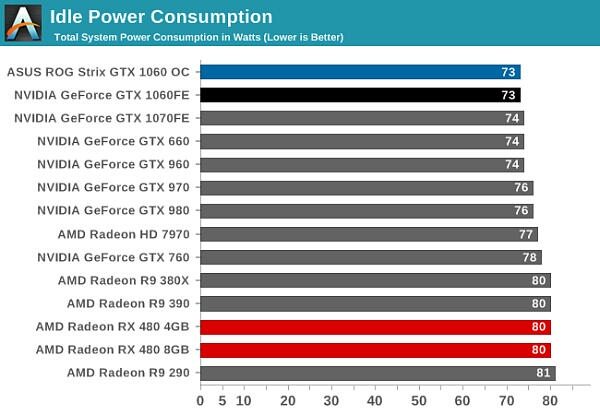 As we’ve already seen with GTX 1080/1070, Pascal’s idle power consumption looks quite good, and GTX 1060 continues this trend. At 73W at the wall, the low idle power consumption of GTX 1060 is crowded out by the rest of our testbed components. 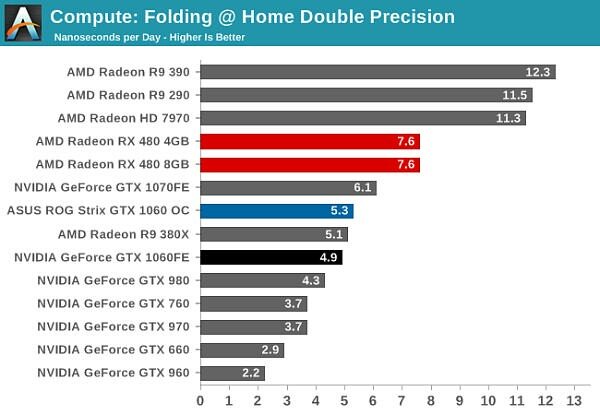 It also highlights that NVIDIA still holds an edge here versus AMD cards. 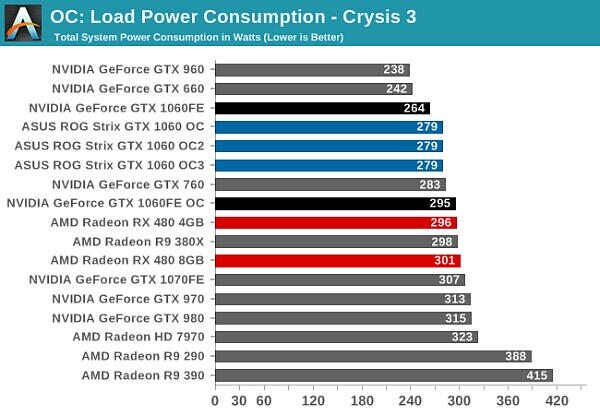 With load power consumption under Crysis 3, GTX 1060 slots in right where we expect it for a 120W TDP card. 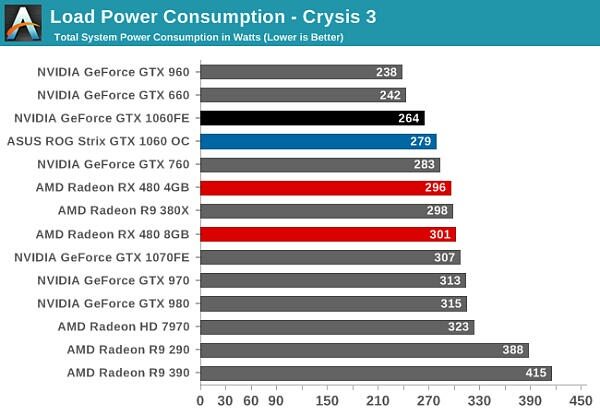 In practice power consumption is higher than past GTX x60 cards under Crysis 3 due to the card’s higher performance, but otherwise it’s second to none. GTX 1060FE holds a significant power consumption advantage over GTX 1070FE, drawing 43W less at the wall, illustrating the power/performance tradeoff as we climb up and down the NVIDIA product stack. Meanwhile GTX 1060 holds a similarly impressive lead over AMD’s Radeon RX 480. Against the 8GB card, NVIDIA’s mainstream competitor draws 37W less for 14% better gaming performance. Since Maxwell NVIDIA has enjoyed a significant power efficiency advantage, and while AMD’s recent Polaris architecture has helped to close the gap, GTX 1060 proves that NVIDIA continues to execute well here. 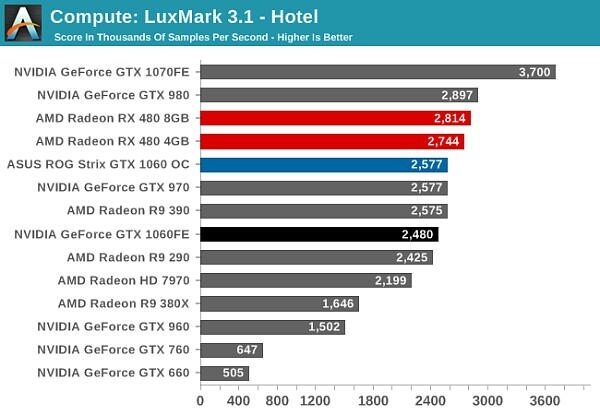 In the big picture the framerate advantage is the icing on the cake for NVIDIA; it’s the power advantage that helps to cement any NVIDIA claims of an architectural advantage. On that note though, one interesting observation is that when looking at perf-per-watt from a performance-constant point of view – that is, how power consumption changes for a given performance level – NVIDIA’s power consumption gains are good, but not fantastic. GTX 1060 saves 51W at the wall over GTX 980, a 165W TDP part. Though not an exact science, the power savings are the ballpark of 30% for a full generation node shrink plus FinFET implementation. Digging a bit deeper, what we see is that while NVIDIA enjoys a power reduction, it’s less than the relative reduction in GPU size. A lot of this, I suspect, comes down to the fixed function blocks of the GPU that are always present: the display controller, PCIe controller, memory controllers, etc. These are still active on GP106, and because the GPU has fewer SMs, they account for a relatively larger portion of the TDP budget. Which is not to say that TSMC’s 16nm FinFET process hasn’t paid off well for NVIDIA – one only needs to look at how much performance has increased at 120W – but it would appear that node shrinks scale up performance to a greater degree than they scale down power consumption. 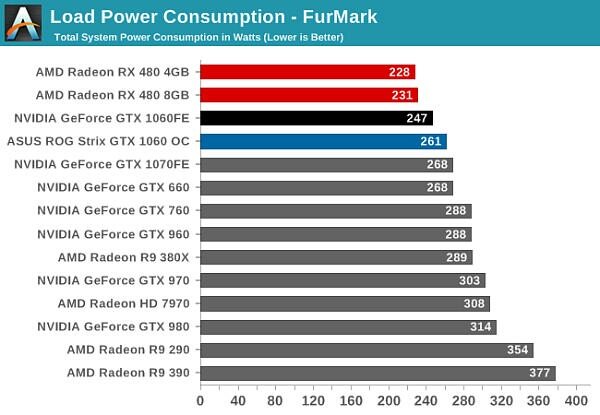 As for load power consumption under FurMark, we’re in an interesting scenario. In practice the GTX 1060 cards draw more power than the RX 480 cards, but at the same time neither of the GTX 1060 cards need to temperature throttle here. 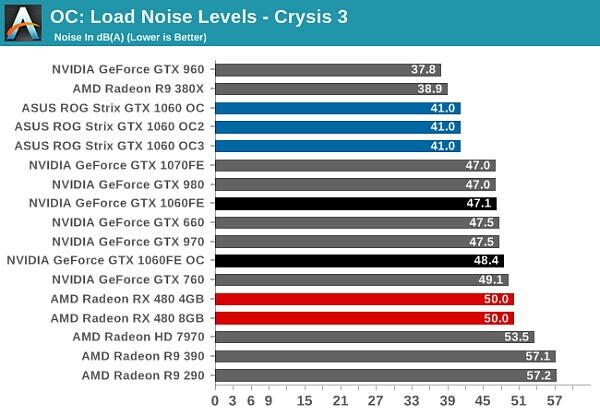 The situation is still a bit more complex than that, but ultimately this is why I have more faith in the Crysis 3 numbers, as FurMark in a backwards sort of way can reward cards that throttle too soon. Meanwhile looking at the ASUS GTX 1060 in particular, while ASUS doesn’t publish an official TDP for their cards, this test strongly hints that their card has a higher default TDP than the NVIDIA standard 120W. NVIDIA does allow manufacturers to do this within reason – when cards are built to handle higher TDPs – and it looks like ASUS has gone ahead and done just this. The Strix GTX 1060 OC’s TDP limit is likely around 130-135W. Up next we have idle temperatures, with no real surprises in store. 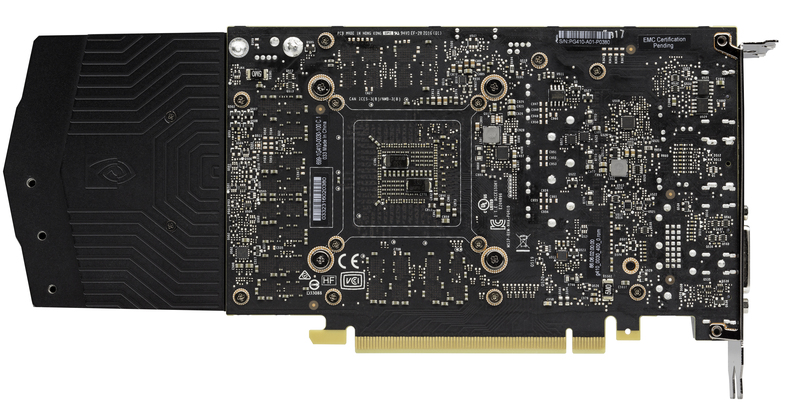 GTX 1060FE is built similarly to NVIDIA’s other blowers, and the ASUS Strix is a large, open air cooled card. Though it is worth noting that in the case of the latter 31C is with zero fan speed idle active, meaning that ASUS’s card is able to achieve great idle temperatures without any active cooling to speak of. Moving on to load temperatures, both GTX 1060 cards perform well here. As I’ve mentioned earlier, the GTX 1060FE never temperature throttles; NVIDIA’s cooler is powerful enough (and tuned such) that the card doesn’t need to compromise between temperatures and performance. This is basically the best case scenario for a blower, and one admitted that more powerful cards can’t usually hit without compromising on acoustics. As for the ASUS Strix GTX 1060, it’s in a class all of its own. At 58C it’s not only ahead of other open air cooled cards like the GTX 970, but it’s downright cool for a video card under load. This is the advantage ASUS enjoys for overbuilding the card like they did: it doesn’t take very much effort to cool a 120W video card with a triple fan cooler. The story is much the same under FurMark. The GTX 1060FE still doesn’t temperature throttle – though to be clear, it’s absolutely TDP throttling – keeping it at 76C. Meanwhile compared to Crysis 3, the ASUS card warms up by all of 1C to 59C. Finally, let’s take a look at noise, starting with idle noise levels. As the ASUS Strix is a zero fan speed idle card, it joins the other cards at the top of our idle noise chart, which happens to be the noise floor. The GTX 1060FE, meanwhile, performs just a bit worse than both the GTX 1070FE and RX 480, idling at roughly 1dB and 0.5dB higher respectively. Shifting to load noise, we’ll start with the GTX 1060FE. NVIDIA’s card may not be built with the full metal shroud of their high-end cards, but its noise performance is virtually identical. At 47.1dB it’s tied with the GTX 980 and GTX 1070FE. 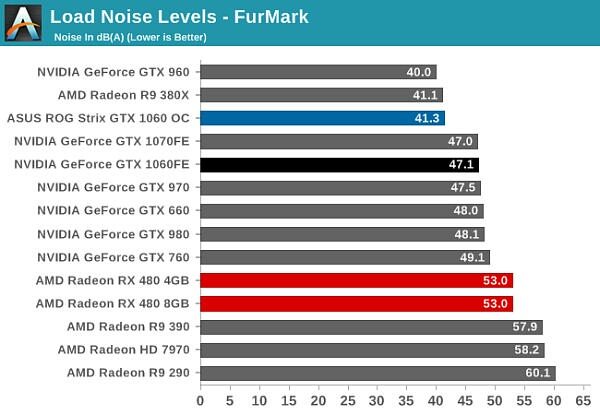 On the one hand this means that the GTX 1060FE doesn’t really gain anything with respect to acoustics despite its lower TDP, but on the other hand this is a significantly cheaper card than either of the NVIDIA high-end cards. In any case, the GTX 1060FE’s acoustic performance is right where we’d expect to see it, and competitive with the best of the blower style cards we have in our charts. 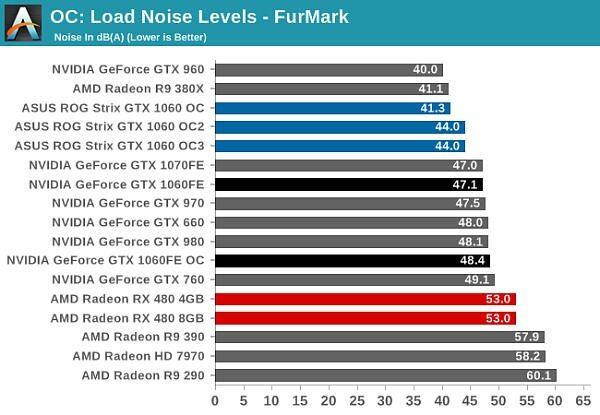 This is also in significant contrast to the reference RX 480, which although it also uses a blower style cooler, can’t manage the same acoustics, leaving the GTX 1060FE 2.9dB quieter. As for ASUS’s Strix GTX 1060 OC, the open air cooled card is in a league of its own, generating very little noise thanks to its large cooler. And in any other review, a 41dB load noise level would likely top the chart. However the similarly open air cooled R9 380X and GTX 960 do edge out the ASUS card here, likely due to the fact that the cooling profile on the ASUS card is a bit more aggressive (e.g. sub-60C temps). Either way this is a strong performance for an open air cooled card. Finally, under FurMark the story with acoustics is basically unchanged. 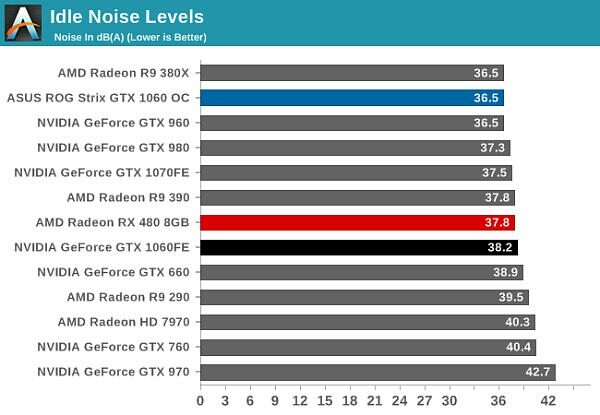 Neither GTX 1060 card has to ramp up much further to handle the load, so acoustic performance is unfazed. This also allows the GTX 1060FE to edge ahead of the GTX 980 (or rather, not fall behind), as the GTX 980 had to ramp up a bit more under this test thanks to its higher TDP. For our final evaluation of our GTX 1060 cards, let’s take a look at overclocking. We’ll start things off with NVIDIA’s GeForce GTX 1060 Founders Edition. This card has a 3+1 power delivery system and a 116% TDP limit. Like the earlier GTX 1080 and 1070 cards, the GTX 1060FE can be “overvolted” to 1.093v to unlock an additional boost bin. We were able to overclock the GTX 1060FE’s GPU an additional 200MHz (12%), bringing the boost clock to 1909MHz. Unsurprisingly, this is very similar to the GTX 1080 and 1070, both of which overclocked by around 200MHz as well. Consequently it looks like both GP104 and GP106 seem to have similar voltage/frequency curves. Meanwhile we were able to push the memory another 1Gbps (13%) to 9Gbps. Our other GTX 1060 is ASUS’s ROG Strix GTX 1060 OC. This card features a more advanced cooler and 6+1 power delivery system, but it also ships with a factory overclock. 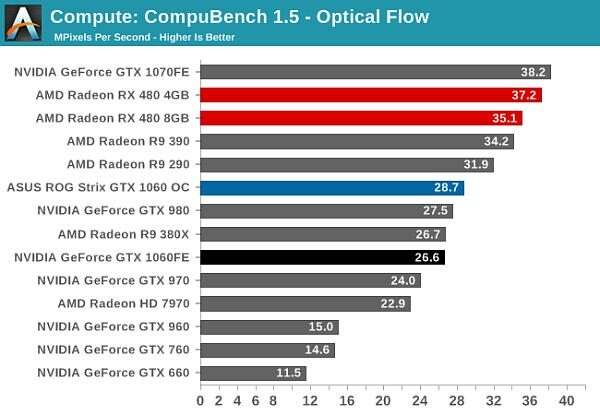 So all things held equal it’s likely that there’s not as much headroom for additional end-user overclocking. Meanwhile the card also ships with a built-in OC setting via ASUS’s GPU Tweak II software, which offers a small, virtually guaranteed overclock. 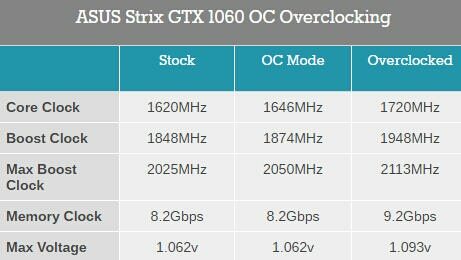 As expected, due to its factory overclock the ASUS GTX 1060 doesn’t offer quite as much end-user overclocking. We were able to add another 100MHz (5%) to the GPU, half that of the stock clocked GTX 1060FE. Though it should be noted that in absolute terms the ASUS card has overclocked a bit farther than NVIDIA’s card, with a base clock 14MHz higher and a boost clock 39MHz higher. Meanwhile we got a slightly higher memory overclock out of the card as well, with the card topping out at 9.2Gbps, 1Gbps (12%) over the card’s shipping memory frequency. 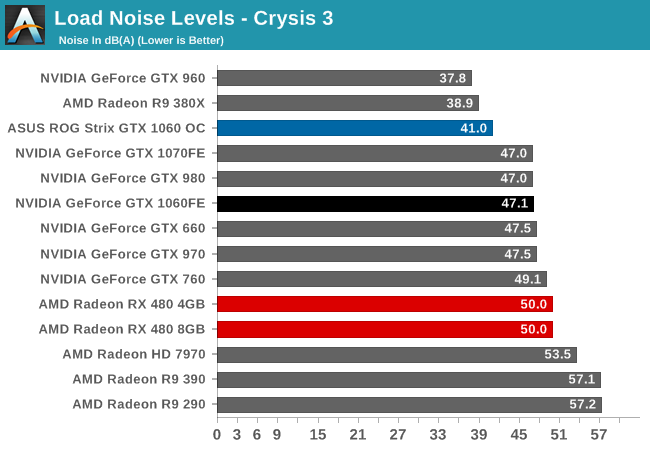 The overall performance gains and resulting power/temperate/noise costs are about as expected. The additional overclock helps the performance of the GTX 1060, but it’s nowhere near enough to close the gap with the GTX 1070. Meanwhile the final overclocks of the NVIDIA and ASUS cards are close enough that their peak performance is neck-and-neck. Bringing this review to a close, while in the big picture we’re still early in the release cycle of the FinFET generation of video cards, the launch of the GeForce GTX 1060 and its underlying GP106 GPU none the less marks an important turning point in this release cycle. While NVIDIA and AMD were content to initially chase different markets with their respective first product releases – going after the high-end and mainstream markets respectively – now that NVIDIA is further fleshing out their product stack, NVIDIA and AMD can no longer avoid each other. So for the first time in this generation we have some real competition, and importantly for so many gamers out there it takes place in the higher volume mainstream market. Overall, GeForce GTX 1060 follows a string of well executed NVIDIA launches throughout the Maxwell and now Pascal generations, and GTX 1060 is no different. NVIDIA has continued to focus on balancing performance with power consumption, and the end result is that like its bigger siblings, GP106 and GTX 1060 follow this trend to a T.
Relative to GeForce GTX 1070, GTX 1060 delivers 73% of the performance of NVIDIA’s enthusiast level card. In practice this puts GTX 1060 a bit closer to GTX 1070 than GTX 960 was to GTX 970 last year; the performance gap between these tiers is a bit narrower, likely as a result of the fact that the gap between GTX 1070 and GTX 1080 is greater. 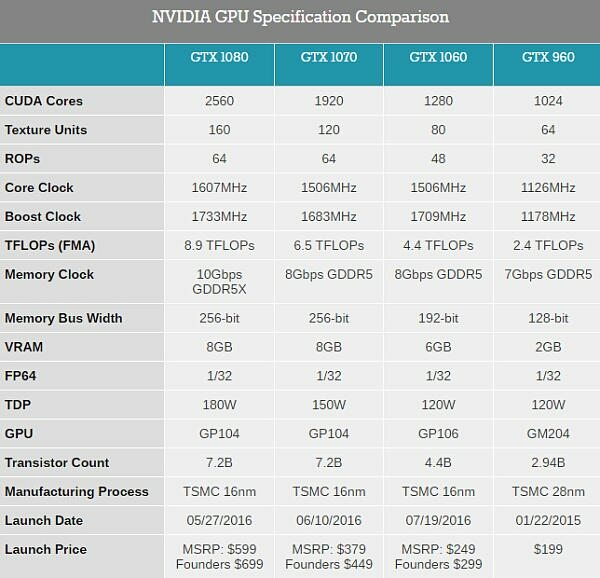 The end result, then is that GTX 1060 offers 73% of the performance for what’s (on paper) 66% of the price. Consequently, buyers looking for GTX 1060 to radically alter the price/performance curve of this generation may come away with less than they hoped for, but mainstream gamers looking for a cheaper Pascal card finally have an option. 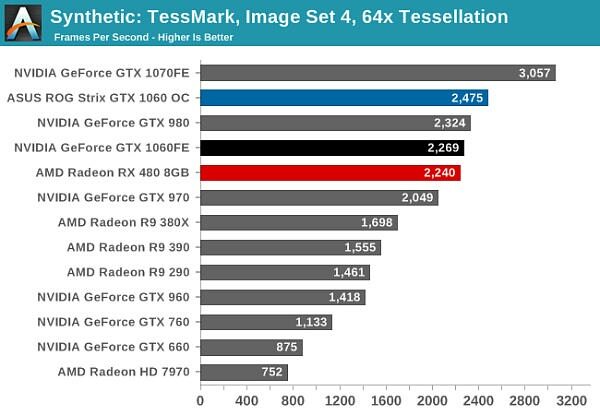 Looking at generational comparisons then, of all of the Pascal cards launched so far, GTX 1060 offers the best performance gains for a single generation. Relative to GTX 960 it offers an 85% performance improvement at 1080p, and even excluding the outliers this is still an 80% gain. 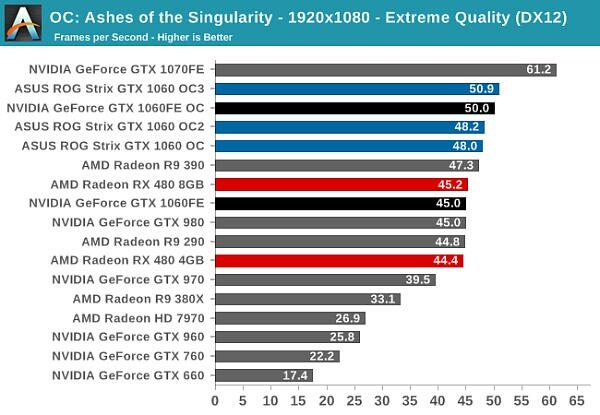 This isn’t quite a 2x performance gain in a single generation, but it is close, and closer than either GTX 1070 or GTX 1080 got. So for current GTX 960 owners, the GTX 1060 offers a tantalizing performance upgrade right off the bat, and for the older GTX 760 and GTX 660 cards the differences are even greater, never mind the newer features NVIDIA has introduced since Kepler. The one catch to all of this is price. Relative to GTX 960 prices for this generation have gone up, from $199 for GTX 960 to $249 for GTX 1060. This is still on the edge of the mainstream video card market (if only barely so) and it’s a price NVIDIA has sold GTX x60 cards at before, but it means that NVIDIA misses out on the $200 sweet spot right now. Instead what they offer is essentially a greater than previous generational performance increase for a greater than previous price. As for where the previously mentioned competitive landscape fits in, a lot of it is going to depend on what potential buyers are looking to spend. At the GTX 1060’s MSRP of $249, the card is countered by AMD’s Radeon RX 480 8GB for $239. The RX 480 is a very capable card, but the launch of the GTX 1060 puts an end to AMD’s short-lived exclusive to that market. And to NVIDIA’s credit (and AMD’s chagrin), the GTX 1060 is 12% faster while consuming less power at the same time, more than justifying the $10 price difference and giving NVIDIA a legitimate claim as the superior GPU. That said, pricing makes all the difference. While GTX 1060’s principle competition is the 8GB RX 480, AMD also launched a 4GB RX 480 specifically to hit the $199 price point and to be a spoiler here. Based on what we’ve seen in the past, I am concerned that a 4GB high-end 1080p card is at risk of being VRAM limited too early in its lifetime. But if that’s something that doesn’t bother you, then the 4GB RX 480’s much lower price makes it a very viable alternative to the GTX 1060 for buyers who need similar performance for a lower price. That is, of course, if you can get a 4GB RX 480. And this brings up perhaps the most difficult issue for any video card buyer right now, AMD or NVIDIA: supply. Partners for both vendors are regularly restocking video cards, but it’s still not enough, and cards are selling almost as fast as they can be listed. The good news for the GTX 1060 is that post-launch card prices haven’t really gone up, so if you can find a card you’ll likely find it at (or close to) that specific card’s MSRP. But it means you have to find a card in the first place. Of course the video card market is no stranger to launch shortages, but this generation is proving unique in just how long so many different cards are in short supply. On that note, this is also why I don’t consider the 4GB RX 480 a greater spoiler for the GTX 1060; of all of the mainstream cards on the market, it’s the hardest to get, as vendors favor producing higher margin 8GB cards. Consequently, if you want a mainstream card right now, your only viable options are the much more closely priced GTX 1060 and 8GB RX 480. In any case, it goes without saying that all of the above buying suggestions are based on cards being on the market at or close to their MSRPs. If card prices do finally slip, then all of this goes out the window. Finally, let’s talk about where the individual GTX 1060 cards we reviewed today fit into the broader picture. With their Founders Edition cards NVIDIA has set out to create what amounts to their own brand for premium video cards, and it’s working. Like the GTX 1080 and 1070 Founders Edition cards before it, the GTX 1060 Founders Edition is a well-built, well-performing card. 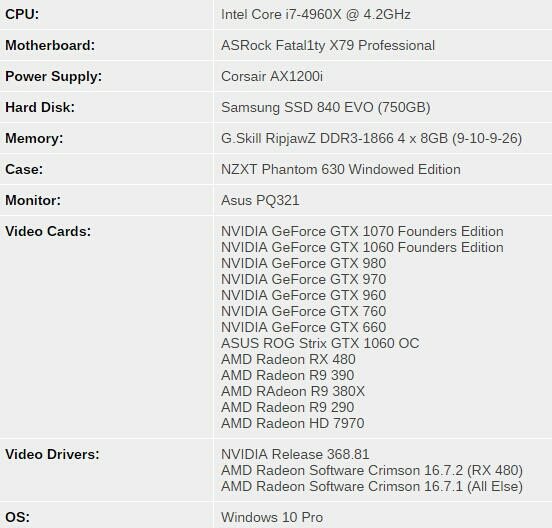 But with otherwise reference gaming performance, it’s not an easy card to recommend given its $50 (20%) price premium. If you need or want a blower style card then it’s a solid choice, otherwise as nice as the card is, the cheaper vendor custom cards still look very attractive. As for ASUS’s ROG Strix GeForce GTX 1060 OC, ASUS has gone for premium market and it shows. Everything from the overbuilt cooling and power delivery system to the RGB lighting and factory overclock put it a step above the other cards, including NVIDIA’s own Founders Edition. However this also contributes to its drawback, which is its price. 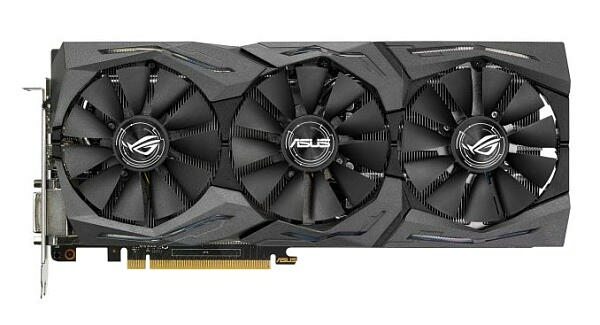 Which is not to say that there isn’t a place in the market for premium cards – that they are so popular with gamers is clear proof that there is – but ASUS is clearly playing in a niche market with a $314 GTX 1060. For those buyers who can pay ASUS’s price premium, I have no doubt they’ll be happy with the card. Otherwise the mainstream masses will want to look elsewhere, as this isn’t a card aimed at them.